In this Article, we discus about the Recurrent form of Herpes Simplex Infections by HSV1 and HSV2. This is the Second part of the Herpes Simples Infections. 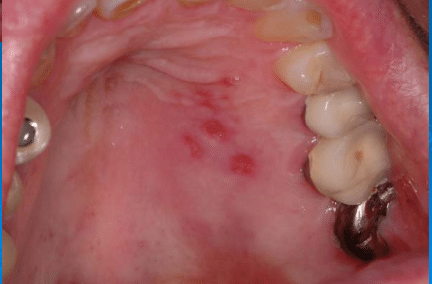 In the Previous Article Oral Ulcers – Herpes Simplex Virus (Primary Infection), we described in details the the primary infection of Herpes Simples Virus Infection. In this Article, we will tackle the Recurrent type of the Herpes Simplex Infection. To Recap, here is a table classifying the types of Herpes Simplex Infections. 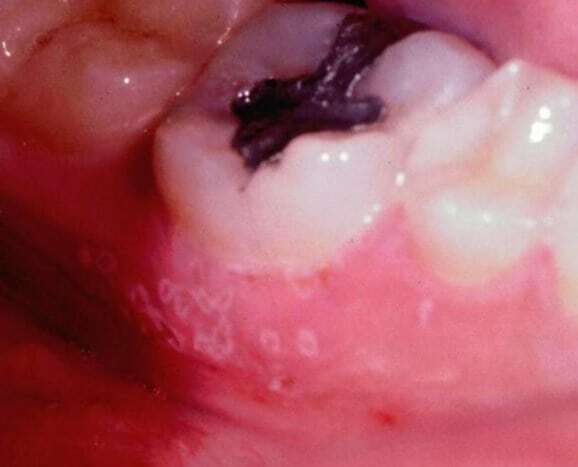 After Primary infection, the Virus travels from the oral site of infection via the Periaxon sheath of the sensory nerve to the trigeminal ganglion and other cranial and cervical ganglia. The virus remains latent in the ganglion in a potentially viable state till reactivates by local or systemic predisposing factors (Trauma, sun exposure, common cold, fever, allergy, stress, menstruation, GIT disturbance and immunosuppression). The virus can be isolated in the trigeminal ganglia of both people who suffer reactivation and those who doesn’t. In case of genital herpes, type 2 becomes latent in the sacral ganglia. Reactivations of infection dose not stimulate a rise in titre of herpes antibody. 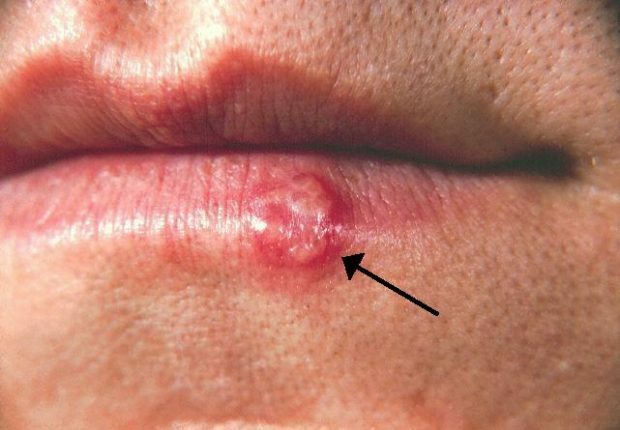 Lesions are either Recurrent Herpes Labialis (Cold Sore) or Recurrent intra – Oral Herpes. Vesicles at the muco‐cutaneous junction of the vermillion boarder of the lip. The virus travels from the trigeminal ganglion down the maxillary or mandibular branches to reach the areas of skinsupplied by these nerves. vesicle formation: vesicles are small in size (1mm), Surrounded by erythema and if it occurs as cluster and my coalesces forming a larger lesions (1‐2 cm). Vesicles may rupture: Ulcerate and covered by a crust of purulent exudates due to 2nd inection. Recurrence: May occur monthly, every 2 months, every year, once in a life time or twice in the life time. Similar to Primary Herpes Infection, Click Here. Self‐limiting in 7 – 14 days and Heals without scar formation. Sun blocker (Zinc oxide) or Sun screen lotion or cream (Paraminobenzoic Acid) andAvoid Sun Exposure. Acyclovir ointment 5 times daily / for five days. The FDA has recently approved a new drug that has proven to be more effective than Acyclovir, Penciclovir 1% topical cream. This cream is used every two hours while awake, and will help shortens the duration and severity of the lesion. Treatment begins within 24 hours after lesions onset. If application of ointment is late, the lesion will respond poorly. Curing Dose: 400 mg / 5 times daily/ till healing. Prophylactic Dose: Acyclovir 200 mg / 3 – 4 times daily or topical ointment. 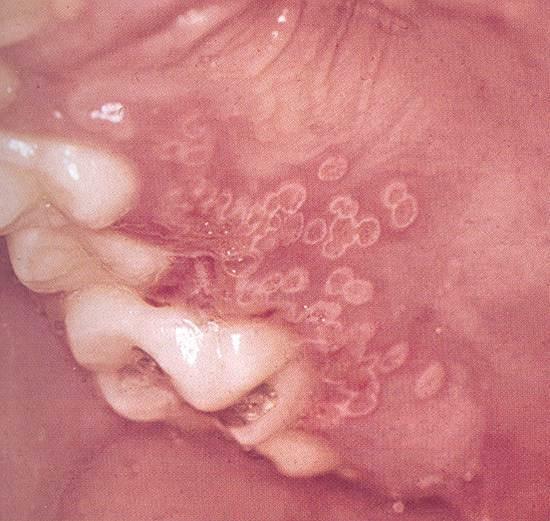 Location: The vesicles appear on the keratinized Mucosa (tongue, Palate and gingiva). Size: The vesicles are pin head sized (1 mm) in size and surrounded by erythema. Nature: They May occur in clusters. Also, These vesicles may rupture forming multiple ulcers and these ulcers may coulees forming larger ulcers which are irregular, superficial, surrounded erythema and are very painful. Heals within 7 – 14 days without Scar formation. Misr International University Article written By Dr. Mohsen S. Mohamed.